A smart, energizing program to help you shed fat, build muscle, and achieve your ideal body in just thirty days! A huge success as a self-published ebook, Burn the Fat, Feed the Muscle is the bible of fat loss that will help anyone to get his or her dream body. 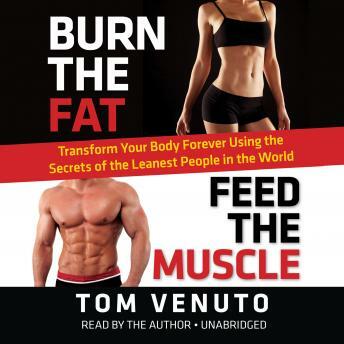 Tom Venuto has created a program using the secrets of the world’s leanest people, although it’s not about getting ripped; it is about maximizing your fat loss through nutrient timing and strategic exercise. This totally revised and 25 percent–new book includes a never-before-shared plan that will make it even easier for everyone to achieve amazing results. *** Please contact member services for additional documents. The information is so helpful and it just helps clear up myths that are going around with the instagram fitness generation. This is the real deal! Tots recommend!! Excellent information! Love the quotes and great narration! I’ve read it if articles and stuff by Tom before and he is so dead on with the advice. You have to find the diet plan that works for you and I am a firm believer in carb cycling over all the others...just my preference Tom, so don’t say something negative!!! He’s one of the best advice mentors out their and remember, 85% of this whole journey is diet. I really think personal trainers should put their students on a diet, I think the trainer should be able to tell if this person is dedicated, and Id so, then trAin but if. That student hasn’t hit at least 10-12 lbs loss, I wouldn’t even take their money....it’s like me, I’m. Hairstylist, that’s my work ppl wear with my signature Series!!!! More trainers should be this way. Anyways. Tom you rock brother!!!! Very good book on physical training, nutrition, mental training. It's the real deal! love it. Having a Bachelor's degree in fitness myself I would say reading this book is like taking a course in exercise physiology. Very informative. Good narration.